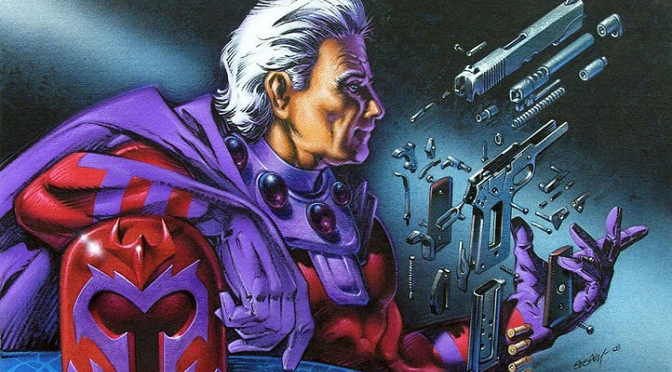 An article recently compared the concepts and issues underlying the X-Men to the gun debate. The argument was that how the public reacts to gun control (and gun owners) is similar to how the fictional Marvel world responds to mutants with dangerous powers. I thought the point about how we dismiss or attack others because of the actions of a few evil people was important. Unfortunately, that point was lost when a comparison between gun owners and the marginalized was made. Thus, I’d like to discuss how gun owners and the gun debate are actually nothing like the problems and message in X-Men comics. The X-Men comics are not about misjudging a group or people because a few of them are evil. Instead, the core message is that you shouldn’t judge groups or people because they are different. The fact that some mutants go to extremes is part of that message and a symptom of bigotry, not the focus. Extremists like Magneto and the Brotherhood are warnings about what oppressed people may be driven to; they are allegories for groups like the Nation of Islam or the Jewish Defense League. In the meanwhile, the movement against gun ownership is because we have the highest amount of gun violence (per capita) in any developed, high-income nation. Any hatred toward a gun owner is not because they’re different – it’s because weak arguments and myths block any attempt to address the issue of guns. Mutants aren’t a representation of people who might or might not have dangerous abilities. They are an allegory for the marginalized and oppressed, those who have been downtrodden throughout history and face systemic discrimination. X-Men was created in 1963 by two Jewish men, both of whom lived through World War II and published at the height of the Civil Rights Movement. These characters and situations were reflections of everything the Jewish people and African-Americans were experiencing. Since then the plight of mutants has spread to other disenfranchised groups. You’ll find metaphors for the LGBT, Muslims, Latinx, and any demographic that has faced societal and systematic bigotry. No matter how much current movements and legislation may seem unsettling to gun owners, we are not a marginalized people. There is no history of oppression or genocide, no systemic discrimination, no hate crimes, etc. In fact, most gun owners are members of the dominant group in our society, and no small number are among the oppressors. Then again, there are also gun owners among the marginalized as well, which suggests that gun ownership is independent of being an oppressed demographic. The powers of a mutant have no relation to a piece of technology in someone’s hands. You can’t compare a person’s innate abilities (dangerous or not) to weapons that you can discard at will. A mutant’s powers are no different than someone’s skin tone, sexual orientation, etc. These aspects are part of the person, not easily changeable, and intricately intertwined with the person’s identity and psychology. People are not born with firearms, and they are not necessary for most; gun ownership is a choice, and it’s one that can change based on environment, job, training, etc. The same cannot be said about mutants, whether they could control their powers or not. Claiming that being a gun owner is anything like being a mutant, racial minority, woman, transgender, etc. is a false equivalence. They are not the same, biologically, psychologically, or culturally; even when an aspect is learned (like a religion), the connotations are far different. We gun owners choose to own guns and take on that responsibility, and nothing is stopping us from one day getting rid of our weapons or picking them again. While some mutants can hide their abilities, many others cannot, and both comics and movies focus on that dilemma. I mentioned culture and religion, which one could argue are “learned” and then compare them to “gun culture.” Once more though, these are not the same thing – one is often an ethnicity or faith that experiences, or is even born of, oppression; the other arose from a love of weapons. The reason African-American, LGBT, etc. cultures appear so unified is that the members had to come together for protection in the face of discrimination. 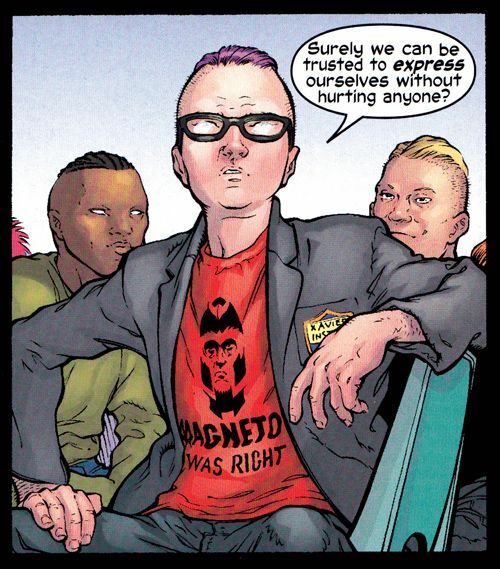 You see this in the X-Men comics as well, whether it’s groups with tattoos or clothing spawned by social movements. Even among various religions, you find ethnicity and race. Judaism is quite strict about converts and is primarily the faith of the Hebrew people. Islam may spread everywhere, but how many people associate its practices with Middle Easterners or South Asians? Dreadlocks, hijabs, rainbows, etc. are a part of these cultures and races, just as important to the one’s self as their skin tone and life experiences. To tell them these things aren’t necessary or acceptable is to tell them their identity and people aren’t needed or allowed. The same cannot be said for “gun culture,” which is really a collection of enthusiasts, hobbyists, and working professionals. 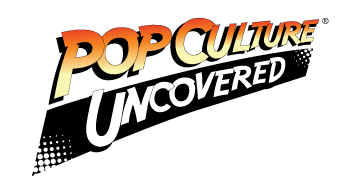 Any culture that arose is little different than Trekkies, Ham radio users, or historical reenactors; this may be a person’s hobby and lifestyle, but it is not a marginalized group. We need to be clear: what gun owners are facing is nowhere near what the mutants face let alone the real world. The systemic bigotry that targets black people, Muslims, transgender, etc. is far more ingrained and different than a social movement demanding gun control. Even if most people were demanding a complete ban (which they aren’t, no matter how much certain pundits and politicians try to spin things), it’s still different from slavery, segregation, hate crimes, etc. Being called “coward,” “idiot,,” “ammosexual,” etc. when you espouse pro-gun beliefs is a drop in the water compared to actual discrimination. There’s nothing new here – not only have many things changed since the days of leaded gasoline, riding in open bed trucks, and smoking around children, but also gun ownership has changed. From the NFA of 1934 to the GCA of 1968 to the Brady Act of 1993, gun owners weren’t an oppressed group or discriminated against when legislation was passed. If things keep moving the way they’re heading, maybe owners and enthusiasts will have to go through more hoops to get guns, and certain types will be restricted. That’s nothing like the continuing fight by African-Americans, women, LGBT, Muslims, etc. for acceptance and equality. Comparing gun owners to the plight of mutants is disingenuous at best – this is not an oppressed population, being hunted and discriminated against because they’re different. The X-Men is not a tale about how people who might be dangerous are restricted because a few of them are bad. The X-Men is about the marginalized and oppressed, and how bigotry can lead some of them to extreme behaviors. If that’s supposed to be an allegory for gun owners, that’s even scarier – it suggests that passing gun control might lead to some gun owners becoming mass shooters and terrorists. Luckily, the X-Men comics aren’t an allegory for gun owners and gun control; reasonable gun owners know this, ignore the name-calling, and instead work with the public toward better solutions for all. We have more important things to do than to try and shoehorn the fight for civil rights onto a group of professionals and hobbyists who’ve been the dominant group since the inception of the country. All in all, the X-Men represent the marginalized – gun owners are not an oppressed demographic.